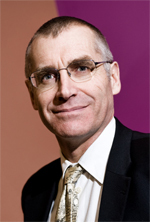 Robert Woodbury holds a Bachelor of Architecture from Carleton University (Lieutenant Governor’s Silver Medal) and Master of Science and Ph.D. from Carnegie Mellon University. He was a faculty member in Architecture and the Engineering Design Research Center at CMU from 1982-1993, at Adelaide University (Australia) from 1993-2001, at the Technical University of British Columbia from 2001-2002 and is now at Simon Fraser University. He was founding Chair of the Graduate Program in the School of Interactive Arts and Technology at SFU and of the Canadian Design Research Network. He is a former Olympian in sailing. Halil Erhan received his BArch degree from Middle East Technical University in Turkey. During his Masters study at Clemson University, he investigated 3D model integration in representing building design and construction information. As a result of this study, he became interested in Design Computation. He pursued this interest in his PhD study at Carnegie Mellon University. The topic of his thesis related to interactive design requirements specification. He is currently an assistant professor of School of Interactive Arts and Technology, Simon Fraser University. His research interests span from design of complex systems and design cognition to software engineering strategies and education. Particularly, he concentrates on generative aspects of complex systems developed for supporting wide spectrum of design activities and visual analytic of latent dependencies in design information space. Siniša's main research interests include computer-aided design (CAD), design cognition, and design in general. His present research focus is on devising, building, and evaluating computational tools that enhance human cognitive performance in design and expert work. His Phd thesis work is concerned with CAMBRIA, a computational tool that allows users to view, compare, and edit multiple design models at once. Karine Kozlova holds a degree of Specialist in Information Systems and Technologies from Moscow State Institute of Radio Engineering, Electronics and Automation (Moscow, Russia). Currently she is a PhD student at the School of Interactive Arts and Technology at Simon Fraser University. She is interested in discovering new possibilities that could help people communicate with software in a more effective and intuitive way. Her PhD research is about the role of history visualization in collaborative decision making. Maryam Maleki holds a Master of Science in Architecture and is currently studying a Ph.D. at the School of Interactive Arts and Technology (SIAT), Simon Fraser University, Canada. Maryam’s Ph.D. thesis is on end-user programming in Computer-Aided Design (CAD) systems. The project proposes programming in the model view as a way to bring the task of architectural design and computer programming closer by imposing scripting on the 2D/3D model. She is also interested in computational geometry, and parametric modeling in general. She enjoys writing small programs in the context of her projects. Vinu is currently a doctoral student in School of Interactive Arts and Technology, Simon Fraser University. She holds a Masters in Digital Architecture (M.Arch) from Anna University, India and a Bachelors of Architecture from Madras University, India. She is interested in computational design, parametric modeling and sustainability. Bachelor of Interior Design (King Faisal University); Master of Architecture (King Faisal University), PhD (Simon Fraser University). After attaining an MFA, David Botta practiced 3D animation with DigiPen Computer Graphics, then at UBC's Imager Labs (under the auspices of MAGIC). His work included architectural visualizations of the geometric principles underlying the Taj Mahal of Agra (with Dr. Ron Lane-Simth), and a walk-through of a sub-garden of the famous destroyed Chinese garden Yuan Ming Yuan (with Xing Xing Computer Graphics). Then he practiced product development, graphical user interface design and interaction design with DNA Multimedia, Recombo Inc, and then social bookmarking and tagging design with CrowdTrust Inc. He also practiced qualitative research and analysis in the area of information security management, with UBC's Laboratory for Education and Research in Secure Systems Engineering. His PhD work focused on analysis of design discourse, and was applied during a post-doc position to implement semantic zoom on analysis history. 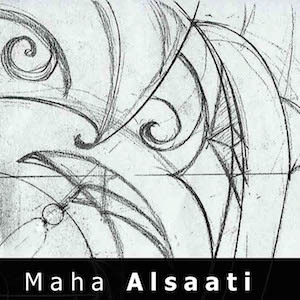 Maha Al-Saati has taught a variety of courses in the field of interior design, architecture, graphic design, digital image design, storytelling, and moving and sequential images. She is interested in amateur culture, as well as religious influence on videos and other art forms produced in the Arabian Gulf region. She is also interested in depiction of architectural spaces in moving images, and the weaving of stories into space and place. Victor Chen received a Bachelor of Engineering and a Master of Science in Information Technology. His PhD research combines data mining to compute implicit relations in large data collections with information visualization of neighborhoods in the computed relations. Its objective is to study interactive computer software to support human problem-solving, decision-making and understanding. In this study, his interest in data mining is as a tool to reduce the millions of items in a collection into a graph with neighborhoods of hundreds of related items. Victor’s main hypothesis is that understanding the neighborhoods and the comparisons among them can be greatly aided by interactive graph visualization. Andy Huang slept towards his Masters of Science at the School of Interactive Arts and Technology as Simon Fraser University. He dreamt about people collaborating across vast distances using futuristic technologies that offers intuitive user interfaces. In his dreams, he enjoyed working with new technologies and gadgets, as well as hacking them to work in fun new ways. In 2009, Diliara Nasirova received her Bachelor of Science degree from Middle East Technical University in Turkey, Ankara, in Computer Education and Instructional Technologies program. Currently she is working towards her Masters of Science at the School of Interactive Arts and Technology, Simon Fraser University. Her research was focused on designing better interfaces considering human factors, particularly, cognition, spatial orientation, visual communication and learning skills. Nahal H. Salmasi holds a Master of Science in Interactive Arts and Technology from Simon Fraser University and a Bachelor of Science in Civil - Structural Engineering from Tabriz University in Iran. In her research, she mainly focused on sensitivity analysis of parametric design models. Holding a Bachelor degree in Architecture and a Master degree of Applied Science in Interactive Arts, Cheryl Qian is specifically interested in the cognitive and HCI issues of application design in terms of supporting designers' intention, creativity and expertise. Her PhD research aims to observe, understand, support and augment user intention and action in parametric design systems. The users she focused on comprise active designers - more specifically, architects and civil engineers. Her objective in the study is to understand the mid-level patterns of work that recur across designers and tasks. Making such patterns explicit may result in improved expert work practices, in better learning material and suggestions for improvements in parametric design interfaces. Experts use their experience of solving problems in the past to build on and create new solutions in new situations. Such experience is part of what makes them experts. Some of these reusable solutions can be expressed in what are known as design patterns. Patterns express design work at a tactical level, above simple editing and below overall conception. A pattern comprises several components, including a name, a problem description, an abstract solution and a discussion of consequences. Through ethnographic studies, we show how patterns can be used to improve learning and work with parametric modeling and discern patterns invented by designers. We argue that the need for patterns indicates the absence of appropriate support for complexity in a parametric modeling system and seek new features and interface designs that enable working at high levels of complexity. The website www.elementsofparametricdesign.com provides the parametric modeling community with well-crafted examples of reusable code. By explaining the motivation, context and details of the code, it enables people to more effectively learn parametric modeling systems and to build larger and more complex models with confidence. 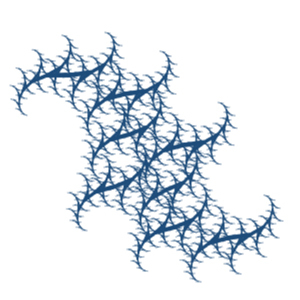 Further, the patterns themselves suggest new directions for the design of such systems as GenerativeComponents. Tsung-Hsien Wang. 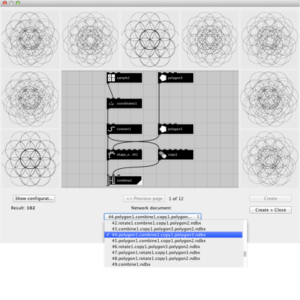 Design patterns for parametric modeling in grasshopper, 2011. 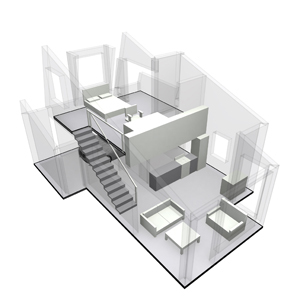 Conventional CAD systems focus design attention on the representation of the artifact being designed. Currently industry attention is on systems in which a designed artifact is represented parametrically, that is, the representation admits rapid change of design dimensions and structure. Parametrization increases complexity of both designer task and interface as designers must model not only the artifact being designed, but a conceptual structure that guides variation. Parametrization has both positive and negative task, outcome and perceptual consequences for designers. Positively, parametrization can enhance search for designs better adapted to context, can facilitate discovery of new forms and kinds of form-making, can reduce the time and effort required for change and reuse, and can yield better understandings of the conceptual structure of the artifact being designed. Negatively, parametrization may require additional effort, may increase complexity of local design decisions and increases the number of items to which attention must be paid in task completion. While there is a general appreciation of the concepts and advantages of parametric modeling, application to projects at the scale and complexity of buildings raises important theoretical and practical issues. In a deep sense, parametric modeling is not new: building components have been adapted to context for centuries. What is new is the parallel development of fabrication technology that enables mass customization. 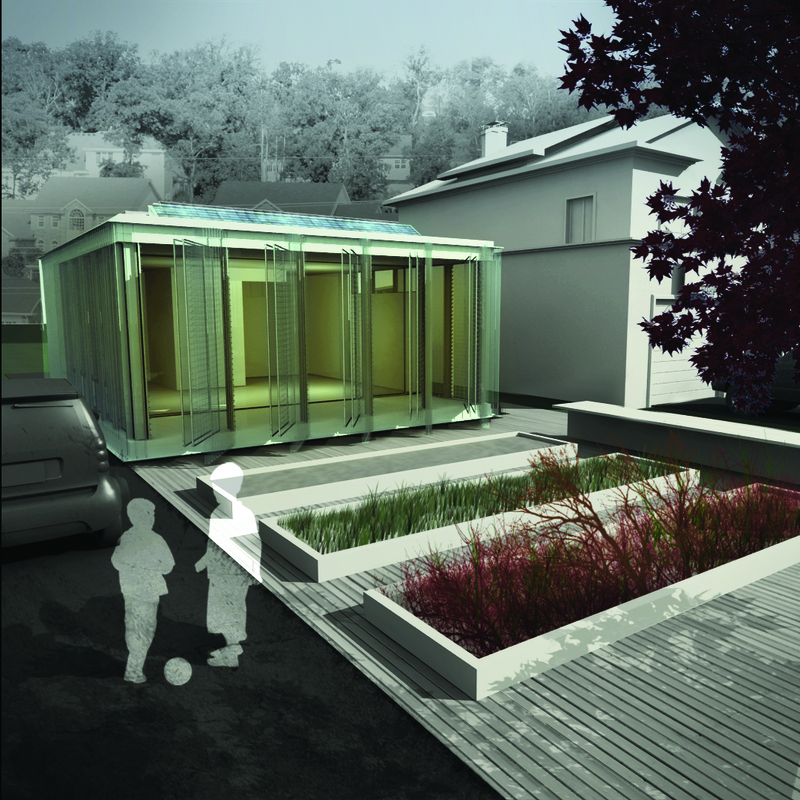 Building components can be adapted to their context and parametric modeling can represent both context and adapted designs. In a design market partly driven by novelty, the resulting ability to envision and construct new architectural forms rewards firms having such expertise. There are relatively few such firms, most of which have had long experience and have built substantial reputations on distinctive form and construction. But many firms and students (future practitioners) are interested. The confluence of technology and interest appears as exploration in a new design space: architecture and its supporting technologies of parametric design and fabrication are experiencing both co-development and rapid change. 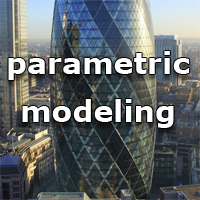 We contribute to scholarly knowledge of parametric modeling in several ways. 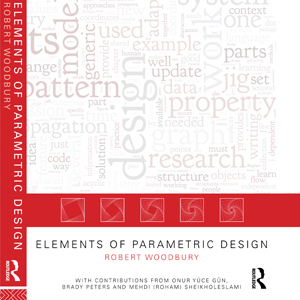 In 2005, Robert Aish of Bentley Systems and Robert Woodbury published a paper on technical features of GenerativeComponents that brought key ideas, such as replication, into the public research domain. 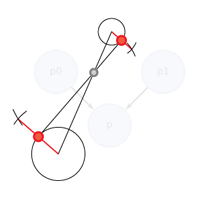 We devise programming constructs, such as goal seeking, that show how parametric modeling can be used for advanced tasks. Using concepts from our design space exploration work, we seek better ways for parametric modeling to support discrete change. In building design, analysis, and manufacturing, architects, civil, mechanical and electrical engineers use Computer-Aided Design (CAD) systems from the earliest stages of design to construction. A typical CAD system’s graphical user interface (GUI) provides a wide range of capabilities. However, designers and engineers who want to engage repetitive, complex or exploratory design ideas must use both the GUI and programming. Most such designers are amateur programmers acting as end-users, not system developers---they have relatively little formal education in computer science or programming. The literature shows that end-user programmers find difficulty when the programming is separate or different from their main task (design, analysis, etc.). Separation of design and program requires switching between tasks, with consequent loss of both focus and efficiency. We hypothesize that bringing the tasks of design and programming closer will positively affect CAD users’ performance and experience. 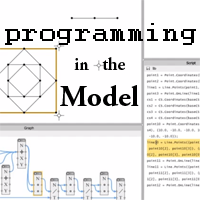 I propose using the model view, which is a common form of representation in all CAD systems, for presenting and editing programming elements such as data, functions, loops, etc. This will not only bring the two domains closer, but also use designer’s visual and spatial abilities to enhance their programming experience. I will not eliminate the textual programming language integrated in CAD systems - the visual language maps to the textual language and both are always editable. This enables users to use more complex conventional programming environments when problems grow in size and complexity. Every task performed in the model is reflected in the textual program (and vice versa) and is accessible to the user. We combine visual programming and direct manipulation techniques directly in the 3D model view. In the current rapid development of parametric design tools the underlying computational-technology outpaces interface design. 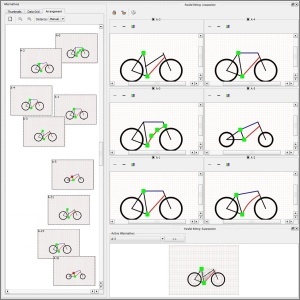 Interaction with these tools is becoming cognitively more demanding – for example, designers must switch between different views, manipulate views to adjust working context in relation to the model, select operations with complex parameters, and differentiate reference geometry from design geometry. The goal of this study is to understand users' cognitive capabilities and limitations in the context of parametric design so that more natural interfaces can be developed. We bring attention particularly to the importance of change control and detection in 3D parametric design. The term “change detection” refers to the visual processes involved in noticing, identifying, and localizing a change in a given visuospatial context. Failure to properly detect changes may easily lead to frustration with modeling in 3D parametric systems and decrease designers’ productivity and motivation regardless of powerful features provided. Moreover, such perceptual issue may lead to design failures. Novel interfaces are required to reduce if not eliminate these effects. To enhance designers' performance we propose using various techniques to visualize changes such as peripheral interface and visual dataflow programming. Design collaboration relies on cognitive tools such as analog media and digital peripheral devices, and shows the characteristics of distributed cognition (Hutchins, 1995). It is a social and complex activity involving multiple agents communicating and using external cognitive tools to encode, decode, and share information in the process of collaborative task completion. The systems supporting this activity should meet the 'principle of least collaboration effort' (Clark and Wilkes-Gibbs, 1986) that proposes that agents in collaboration minimize their effort in presentation and acceptance of arguments (information). They should also adapt the minimal interference principle to ensure task completion to be as simple as possible. We have yet to see a design-collaboration support system that adapts these views. Currently, collaboration uses dispersed mixed media that is often overloaded with representations and functionality, thus preventing seamless information sharing. Designers are required to spend extra effort collecting information using peripheral devices and in system management when sharing information. 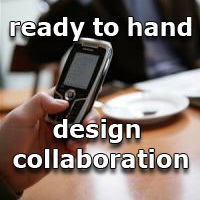 This hinders design collaborations, as the system becomes a bottleneck in information exchange. Such systems go against Clark's principle (1986) by imposing overheads that potentially lead to designers neglecting to both add and retrieve information. The overheads are also observed when associating information within a design process because existing information is effectively inaccessible. The goal of this study is to understand these overheads in information collection and sharing using peripheral devices, and to provide designers with a supportive platform to enhance collaboration using both analog and digital media. The platform is envisioned to improve productivity and reduce redundant work by integrating peripheral devices into the collaboration workflow. Information acquired using these devices should flow into the collaboration knowledge base as effortlessly as possible, without forcing them to perform extra tasks. More-over, designers should be able to choose quickly which information is to be shared with other collaborators. Designers, architects and engineers use simulation tools in predicting the energy usage of buildings. Indeed, use of such tools is increasing in practice, pushed by increasing client and societal demands to improve building performance. Current simulation tools tend to focus on the physical aspect of the building`s energy usage and, as a simplifying assumption, confine the consideration of the inhabitant interaction to fixed, scheduled or rule-based} behavior. Yet, the literature clearly identifies that how inhabitants use buildings has a large impact on the energy consumption in all buildings (including, and perhaps especially so-called sustainable buildings) and is one of the reasons for the vast difference between predicted and actual energy consumption. Further, inhabitants have various options to choose for the desired comfort and the choice may depend on their understanding of how their interaction affects the energy consumption. Both inhabitants' and designers' perspectives present challenges. Neither seems to ``talk" to the other. A common language, an ``eco-dialect", between designers and the inhabitants, might help the situation. The lack of mutual understanding could be one of the reasons for the vast difference in the predicted energy and the actual energy usage by the inhabitants. On one hand, decisions taken by architects and engineers are largely hidden from inhabitants: people do not and cannot know how designers intend buildings to be controlled, nor do they know how a building might react to a control decision. On the other hand, designers know little of what inhabitants actually do in controlling buildings. Two questions seem evident. The first is ``How do inhabitant's know what action they need to take to achieve the desired comfort in any environmental condition?" The second is ``How can designers predict and support productive inhabitant action?" The objectives of this thesis are: a) to identify and understand how inhabitants interact with and control buildings, including their elements and systems, b) to understand how the inhabitant`s interaction and control can be enriched by providing ``Light Weight Look Ahead Options" (LWLAO) of the actions they can perform and their effects on energy consumption in the building. ``Light Weight Look Ahead Options" provide quick simulation of the possible inhabitant`s interaction to predict how it impacts comfort and energy consumption in the buildings, c) to understand how LWLAO changes inhabitant interaction and control, d) to demonstrate LWLAO to designers, architects and engineers to begin to understand how design work might be affected by providing them better understanding of inhabitants` choices. Computational design tools assist designers in their professional work, one key aspect of which is devising, evaluating, and choosing among multiple design alternatives. Yet, with few and limited exceptions, current tools handle just a single design model at a time, forcing users to adopt various ad-hoc strategies for dealing with multiple design alternatives. We describe CAMBRIA, a multi-state prototype tool for simultaneously managing multiple 2D vector graphics models. 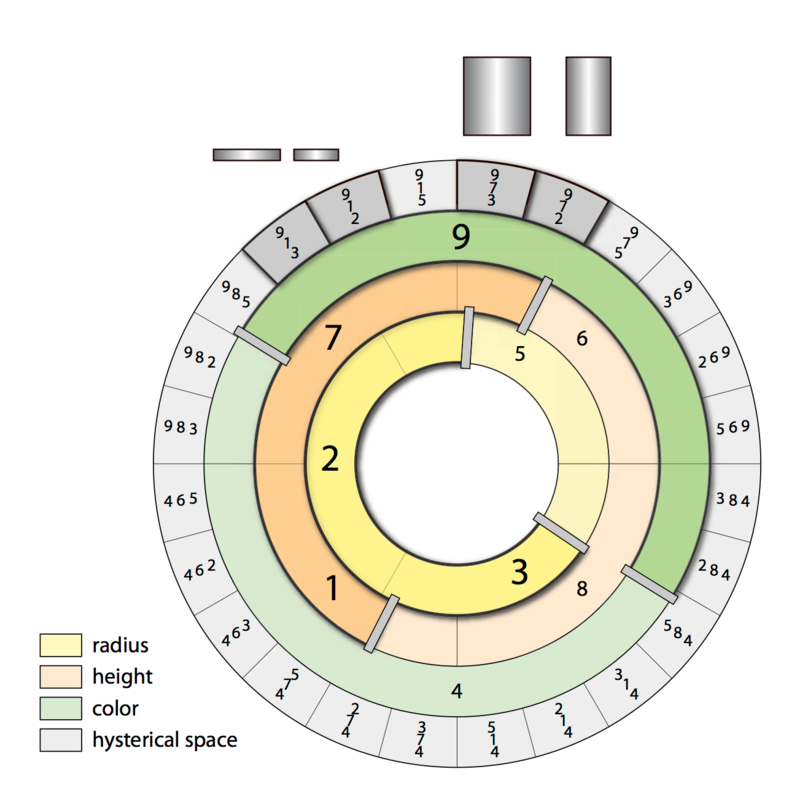 Based on analysis of expert feedback, we propose an initial set of system design guidelines for building graphics editing systems capable of managing multiple, simultaneously available design solutions. We believe that these guidelines can be successfully applied in other areas of work in which people consider multiple alternatives. When people solve problems they explore a variety of different solutions. Parametric systems have been added to the interaction models of design tools to make it easier to make changes to a design. Just as cell is changed in a spreadsheet, when a parameter is changed all parts of the design that depend on that parameter update. While tools with parametric systems are powerful, users are limited to single state solutions and are forced to use workarounds like using layers, and file naming conventions. To add support for alternatives in parametric systems, we introduce a new type of node called a subjunctive node and describe a data-flow language Shiro designed to allow artists and designers to define alternatives in parametric systems. Designers devise and explore alternatives as they work. Current parametric modeling tools can work against this essential feature of design work: they require advanced skills in constructing hierarchies of elements and defining relationships among them. Successful exploration is contingent on designers’ ability to interact with complex parametric representations. As a consequence, designers often make hard commitments to design decisions at an early stage of the design process, when they have not yet found potentially viable designs, nor have they received enough feedback about the alternatives they are exploring. Parametric modeling shares many activities with text-based content creation such as writing, for example, combining elements in different sequences, composing hierarchies of elements, varying properties, binding entities through relationships, replacing content, cross-referencing elements, and assembling wholes from parts. The similarities in both domains, and the simpler context of text, inspired us to build a text-editing prototype that focuses on developing a hierarchical, multi-state, data model that supports parallel exploration of alternatives. Unobstructed by the complexity of parametric modeling, we developed Alt.Text. We hypothesize that the features of Alt.Text are portable to other domains, not only that of parametric modeling. We seek new ideas and tools that can help people make decisions collaboratively, especially in recalling and reusing past work. Current decision support and history tools suffer limitations, such as lack of integration and visualization capabilities or imposing rigid structure on thinking processes. These tools are often geared towards highly differentiated roles and are data centric. Further, they fail to support key aspects of collaborative decision making. In general, history’s benefits are deferred, while tasks are immediate. In sharp contrast, people focus on work for which the immediate perceived benefit exceeds its cost. As a result, there is a clear need to better support histories in collaborative decision making at all stages of turning data into knowledge and action. We suggest that the use of visual history mechanisms could better support knowledge capture, knowledge transfer and knowledge reuse in both individual and collaborative work. Based on literature review and three case studies of professional collaborations in design, engineering and business environments, we created a system design framework that we believe is useful to support remembering and reconstruction of past decisions. Based on this framework we developed a set of possible design responses in the form of user scenarios, system interface mock-ups and an interactive prototype (web application) to further explore issues in decision recording, remembering and reconstruction. One of the key issues we are exploring is to identify where knowledge can be captured in the system and how it might be digitally managed for searching, report generation, sense-making and analysis processes. In this research we also explore models of story-telling as well as methods and tools of visualizing history data. A synthesis of conclusions and principles of design for this class of software will be the concluding goal for the project. Designers reflect-in and reflect-on their design process, for this they need a record of their design moves. In many cases the design process is as important as the design outcome itself. In parametric CAD (pCAD) this is particularly true as the record of designer actions are the elements on which the parametric model is built. Current pCAD systems provide designers with limited tools for recording, viewing or analyzing the design process. We propose the Design Analytics framework to characterize the design process as an artefact for design; the framework consists of design process feedback, tools for analysis and enabling the re-exploration of the design space based on analytic reasoning. The Design ReExplorer prototype was developed to test these ideas and evaluate its insertion and viability in real-world scenarios through an expert panel study. The results of the study are favourable with positive feedback and multiple suggestions for future work. 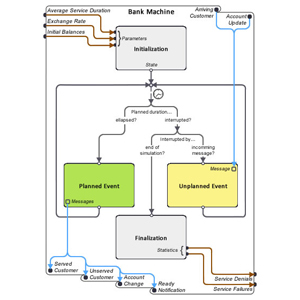 Although the Discrete EVent System specification (DEVS) has over recent decades provided systems engineers with a scalable approach to modeling and simulation, the formalism has seen little uptake in many other disciplines where it could be equally useful. Our observations of end-user programmers confronted with DEVS theory or software suggest that learning barriers are largely responsible for this lack of utilization. To address these barriers, we apply ideas from Human-Computer Interaction to the design of visual interfaces intended to promote their users' effective knowledge of essential DEVS concepts. The first step is to propose a set of names that make these concepts easier to learn. We then design and provide rationale for visual interfaces for interacting with various elements of DEVS models and simulation runs. Both the names and interface designs are evaluated using the Cognitive Dimension of Notations framework, which emphasizes trade-offs between fourteen aspects of information artifacts. As a whole, this work illustrates a generally applicable design process for the development of interactive formalism-based simulation environments that are learnable and usable to those who are not experts in simulation formalisms. Visual analytics tools provide powerful visual representations to support sense-making processes. Analysts typically repeatedly work through a series of steps, varying various parameters each time. Few visual analytics tools support this process well, nor do they provide support for visualizing and understanding the analysis process itself. 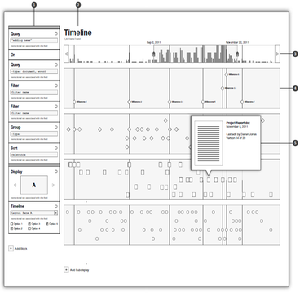 To help analysts understand, explore, reference, and reuse their analysis process, we developed a new visual analytics system called CZSaw (See-Saw) that provides an editable and re-playable history navigation channel in addition to multiple visual representations of document collections and contained entities (in a manner inspired by Jigsaw). Conventional history navigation tools range from basic undo and redo to branching timelines of user actions. In CZSaw's approach, user interactions are first translated into a script language that drives the underlying scripting-driven propagation system. The latter allows analysts to edit analysis steps, and ultimately to program them. Second, built on this base are both a history view showing progress and alternative paths, and a dependency graph showing the underlying logic of the dependencies among the results of each step. These tools result in a visual model of the sense-making process, letting analysts visualize their analysis process, and thus reinterpret the problem, explore alternatives, extract analysis patterns from the existing process, and reuse the patterns with other related analyses. The CZSaw group was awarded the VAST 2010 Mini Challenge 1 award for "Outstanding Interaction Model." It was also awarded, jointly with two other Simon Fraser University teams using other visual analytics tools, a Grand Challenge award for "Excellent Student Team Analysis"
Shape schema grammars generalize parametric shape grammars so that both rules and the objects to which they apply are expressed with shape schemata. We define shape schema grammars, starting with a notation for schemata in general and shape schemata in particular. Schema equality is shown to have at least three possible definitions, of which schema consistency is the most useful. 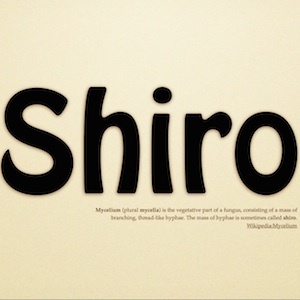 A limited notion of shape schema maximality potentially reduces the size and redundancy of a given schema. Shape schema subpart is a multifunction returning all of the possible ways that one shape schema can be embedded in another. Shape schema difference and addition complete the basic mathematical operations over shape schemata required to define shape schema rules, grammars and languages. Clearly, exploring multiple alternatives can lead to better designs. Despite this well known fact, current computer-aided design systems provide only the most rudimentary tools for generating, storing, and visualizing alternatives. Hysterical space is a novel approach to discover alternatives in the solution space by using the interaction history with a parametric model. Implicit in any parametric model are the states a designer might have reached by combining variable settings in new ways. Such a model exhibits hysteresis, that is, path dependence — thus the name hysterical space. We give a simple definition of hysterical space as the Cartesian product of variable settings. It provides orderings of the space that yield feasible interactive search strategies. 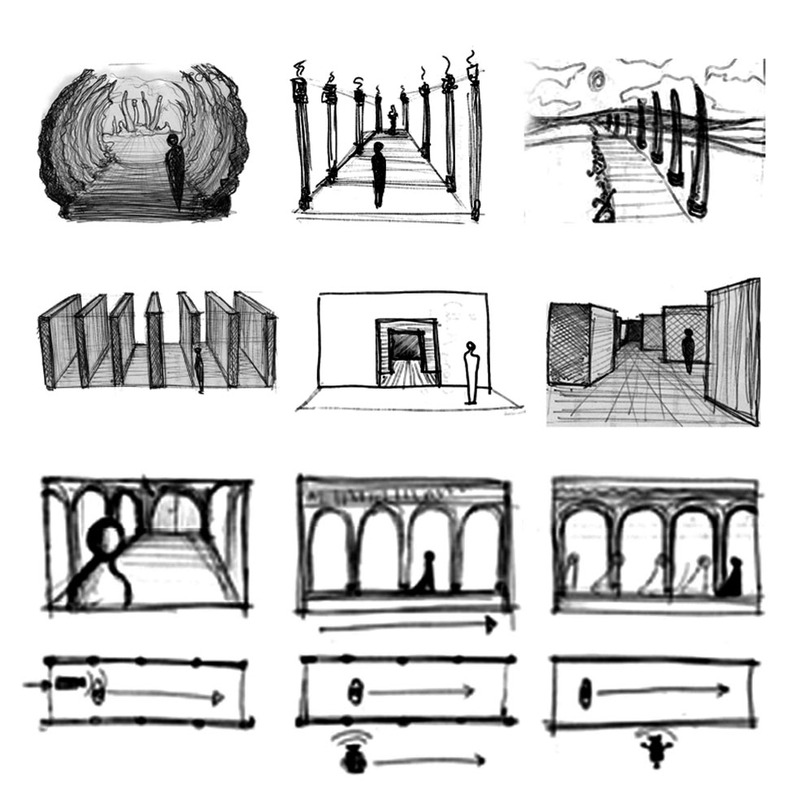 In turn, these orderings suggest interaction designs, which we report as working prototypes. Limited user evaluation supports a claim that hysterical space may be a useful approach to design space exploration. We present GEM-NI – our new system for creating and managing alternatives in generative design. Making alternatives is a key feature of creative work, yet is poorly supported in most extant tools. GEM-NI enables various forms of parallel editing via new methods to control which alternatives are affected by a given edit. We also introduce a novel method for post-hoc synchronization of alternatives, which we called synch paste. Moreover, our system supports a number of ways to create alternatives, including a new method for creating alternatives from a graphical history that retains the lineage. Another way to create alternatives is via an interactive design gallery interface, which includes several improvements over previous work. The original North House Website originated from the partnership between the University of Waterloo, Ryerson University and Simon Fraser University. With the combination of passive and active solar design, integrated energy production, customized components and mobile interactive technologies, an attractive high performance home has been built.It is our hope to set a new standard for solar design in Canada’s northern climate. Our team comprises a unique and unparallelled group of academic, government agency, industry, and professional partners to partake in the advanced research, design, and overall construction of the North House. Through the interactive and integrated design process, every one of our member’s contribution has optimized and refined the elements of the house. The result of a partnership between government, academia and industry, West House was showcased during the Vancouver 2010 Olympic Games at the Vancouver Yaletown LiveCity Site and is now in its legacy installation on a City of Vancouver owned site where it serves as a technology showcase, research and development test bed, and a "living lab". Exploring problems through multiple alternatives is a key aspect of design. We present a prototype system as an extension to existing parametric CAD tools that enables parallel generation and editing of design alternatives. The system is built on two fundamental ideas. 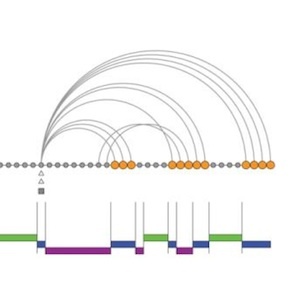 First, use of subjunctive dependency graphs enables simultaneous work on multiple design variations. These graphs capture and reveal complex data flow across alternative parametric CAD models. Second, prototype-based modeling provides a weak notion of inheritance enabling incremental description of differences between alternatives. The system is intended to be general enough to be used in different CAD platforms and other systems using graph-based modeling. The three basic system functions are definition of alternatives (variations) using prototype-based modeling, structural and parametric divergences of the prototypes, and interactive comparison. The goal of this research is consistent with the general qualities expected from any creativity support tools: enabling exploration and simultaneous development of variations. exploreForm implements novel interactions for exploring design spaces over a simple representation for recursive patterns. 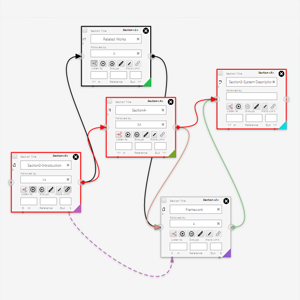 A combination of multiple interactive states, state linking and unlinking, and snapshot creation and restore operators combined with immediate interactive exploration enable rapid generation and exploration of the design space. We present a descriptive analysis of the architectural space in moving and sequential images. It uncovers foundational principles that architects rely upon when creating architectural images. Some common themes found in architectural animations included: (1) the restless, roaming camera; (2) the marketing myths these images portray; and (3) the lifeless spaces. We compare these animations to video portrayals of space produced by several artists and filmmakers. We identify and propose new patterns for spatial portrayal that architects could use to improve architectural animations. These patterns include: (1) patterns of camera movements or stillness, (2) patterns of sequencing and editing; (3) patterns of spatial construction; (4) patterns of architectural narratives; and (5) patterns of bringing space alive. We are faculty and graduate students in the School of Interactive Arts and Technology at Simon Fraser University. We come from many disciplines, many countries and many cultures. What we have in common is intense interest in design and how it is being transformed by computation. We seek to create ideas, interfaces, algorithms and systems to lead change. Design work is now done with digital media. This has profound effects on the work itself and the designs produced. Digital data are shared among professionals and are a means for public engagement in design. Firms employing new digital tools can gain real advantage in national and international markets. The Computational Design research group aims at new ideas, models, representations and systems for design in the complex contemporary world. Computational Design seeks to understand design and to use computers to do so. Our vision is to create compelling computing aids that complement the capabilities of designers in general and flexible ways. We do both basic and applied research. There is much yet to be understood about design and computer models that might support it. However, such models fail a test of falsifiability if they remain unimplemented. In addition, questions of the appropriate human-computer interfaces cannot be addressed in the abstract—progress here relies on well-founded implementations. We see our research mission as building basic theory, and constructing, testing, using and disseminating representations, algorithms and implementations, both to develop and test theory and as tool prototypes in their own right. What is especially unusual about our work is its implementation emphasis. It is clear to us that high-quality, tested, prototype implementations of design generation mechanisms are essential to future theoretical progress in the field and to its application outside of academia. Knowledge remains the product of our work, but implementations and their use are necessary prerequisites. Achieving these aims requires a multi-disciplinary basis. In understanding design we proceeded from the work of others, for example, Prof. H. Simon (late of Carnegie Mellon) and Prof. A. Newell (late of Carnegie Mellon), who set out models of human thought that describe higher level cognition in information processing terms. 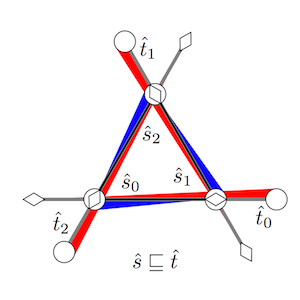 Such models are a ready structure onto which computational extensions can be grafted. In recent years, We use ethnographic methods to understand human thought and action at larger time scales and with greater ecological validity than typically achieved with information processing models. We have been influenced by those, for example, Prof. R. Coyne (Edinburgh), who claim that design is a phenomenon only partially apprehended by any single model. In understanding how computing applies to design, we proceed partly from formal models of design generation and representation developed by, for example, Prof. U. Flemming (Carnegie Mellon), Prof. R. Krishnamurti (Carnegie Mellon), Prof. William Mitchell (MIT), and Prof. G.Stiny (MIT). 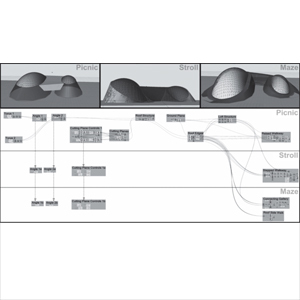 These models posit a space of designs that can be traced out by operators that generate designs from other designs. To use such models requires the representation of designs, especially their geometry. Thus the large field of geometric and solids modelling are important sources for us. The GRAND NCE undertakes a comprehensive research program whose goal is to understand the underlying technologies and to make selective advances in a coordinated, multidisciplinary setting that lead to social, legal, economic, and cultural benefits for Canadians. SAP is the world’s leading provider of business software, offering applications and services that enable companies of all sizes and in more than 25 industries to become best-run businesses. With more than 97,000 customers in over 120 countries, the company is listed on several exchanges, including the Frankfurt stock exchange and NYSE, under the symbol "SAP." Autodesk, Inc. is a world leader in 2D and 3D design, engineering, and entertainment software for the manufacturing, building and construction, and media and entertainment markets. Since its introduction of AutoCAD software in 1982, Autodesk continues to develop the broadest portfolio of state-of-the-art software to help customers experience their ideas digitally before they are built. Fortune 100 companies as well as the last 15 Academy Award winners for Best Visual Effects use Autodesk software tools to design, visualize and simulate their ideas to save time and money, enhance quality and foster innovation for competitive advantage.